New this week from Hannover House is Zombie Warz: Falls The Shadow, directed by Steven Berryessa and starring Bethany Berryessa and Ron Berryessa. 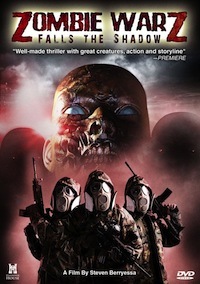 The original Kickstarter for the film described it as such: "Falls the Shadow is a post-apocalyptic thriller; a tale of hope in the darkness set in the destroyed Southern United States." Zombie Warz: Falls The Shadow is available now on DVD. "For the undead, life begins again..."